Christmas Holiday Gift Baskets offer everything to enjoy a gourmet Christmas this year! Each of our products is carefully chosen and certified Kosher, ensuring the highest quality. Each of these incredible gift baskets will bring the gift of gourmet elegance to your family, friends, and business associates. 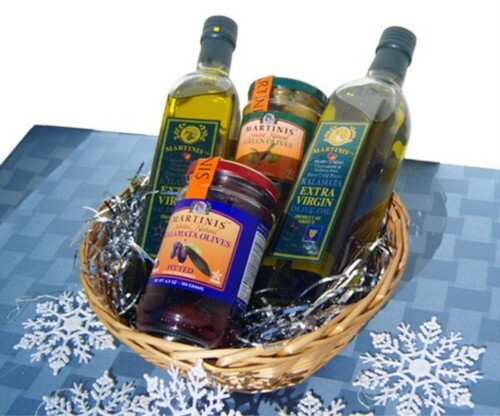 The olive assortment is packed in a handsome reusable wicker basket and elegantly wrapped. (9" diameter x (approx. )7" high, 4.4Lb basket. Shipping box 11"x8 1/2"x5 1/2". Note: Basket design/color & ribbon color may vary; picture posted is an example of how the basket will look with the products. For Christmas delivery, please order by December 15th. Hanukkah Baskets available too!